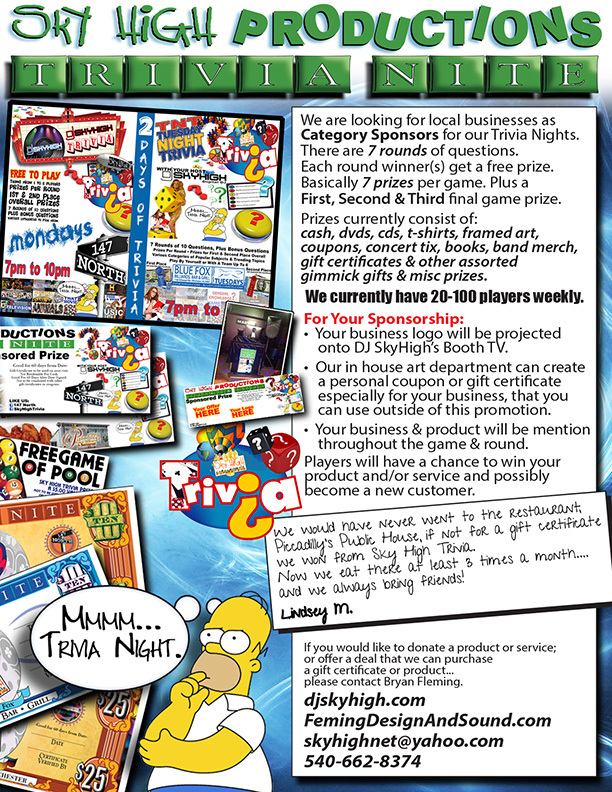 Sky High Trivia is a 7 to 10 round FREE trivia game lasting around 2 hrs. It consists of various questions from different categories. Teams can consist of 1 to 6 players. Prizes are awarded for 1st, 2nd & 3rd Place. Prizes are also awarded for perfect rounds, secret categories, or special questions & bonuses. All Prizes will be given to the team leader to be distributed throughout the team as you decide. Gift Certificates can be used in the restaurant for food only or in the pool hall for credits. and whatever else we can get cheap or donated.